Okay. Let's go ahead and get started copying a theme. Since we've used the bartik name as a base for our sub-theme examples, let's go ahead and use it again as the base for our copying example. So the first step is to go the themes directory and we're going to copy the bartik theme. We're then going to paste it inside of our sites, all, themes directory. Now if we went to our appearance page in our Drupal site, we'd see that there's only a single bartik theme listed. Let's go ahead and go there. I'm going to jump to my browser and refresh the appearance page. And you see we have Bartik 7. 0 here. And if we scroll down we don't see it on our other themes there or in our Disabled Themes. So this is demonstrating that one of them is overriding the other. And if we check the source for this screenshot right here, we'd see that it's coming from our sites, all, themes directory. So this means that we can go ahead and modify the bartik theme without changing the name if we really wanted to. But in general that's going to be a bad practice because it makes it ambiguous. It's hard for other people to figure out exactly which theme they're working with at any given time. So let's go ahead and begin the process of changing our name. And let's go ahead and change it from Bartik to BAT copy or Build a Theme copy. Okay. Our first step is to change the folder name for our theme. 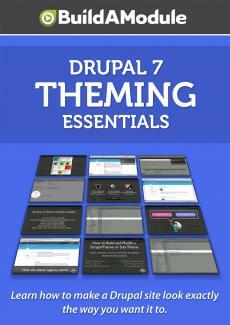 So go ahead and jump back to the base folder for your Drupal site and in your site, all, theme directory. Let's go ahead and change the bartik folder name to batcopy. Go ahead and expand that. And we also need to change the name of dot info file. So we're going to change bartik dot info to batcopy dot info. All right. Now we've changed actually the core name of our theme. So at this point, if we jump back to the appearance page. I'm going to back to the browser and I'm going to refresh it. We scroll down. You see that we have a Bartik 7 here under our Disables Themes and then we also have the bartik theme under our Enabled Themes. So this makes it difficult to figure out which bartik theme we have enabled and which we don't. So let's go ahead and change the name in our info file as well. So I'm going to jump back to our theme folder and I'm going to open up the batcopy dot info file. And let's go ahead and change this name to BAT Copy. So right here we're just changing the name. Okay. Make sure that's saved. And now if we jump back to our browser and refresh, we'll see if we scroll down to our Disabled Themes that we have BAT Copy 7. 0 right here. Now at this point if we enable out theme, we're going to have a whole lot of functions inside of template dot php file that use the bartik theme structure name instead of our new bat copy name. So those functions that might be looked for throughout our theme aren't going to be found. So there's probably going to be a few errors if we enable it, but let's go ahead and enable it just to see what it looks like at this point. Okay. It says here now that BAT Copy is the default theme. So let's go ahead and go to the homepage where this theme is actually going to be used. Now if we refresh the page, we see there's a couple of notices here of an undefined variable hide site name on different lines of the page dot tpl dot php file. So we have a couple of small errors. This isn't a big deal, easy to fix. But the real problem is that we have all of these pre-processing functions or process functions inside of our template dot php file that aren't being registered because they're not using the correct structure for our new theme name. So if we jump back to our directory where we have our theme and we open up the template dot php file, we'll see that we have a number of places where bartik is being used a prefix for a function. So bartik preprocess html and if we scroll down, bartik process html. So we need to go through this entire page and change everywhere where it says bartik underscore intobatcopy underscore. So I'm going to go ahead and copy this and I'm going to open up a replace dialogue where we can find and replace throughout this page. Now this will look different depending on what editor you're using and we're going to replace it with batcopy underscore. Now adding this underscore just helps narrow down the range of things that will be changed. Sometimes we have a place where the original theme name is being used but we want to replace it with something slightly different. So we want to just make sure that we're targeting the right options here and so that underscore helps it narrow it down. So let's go ahead and do a find next and replace. And I'm just going through it and you see down here the highlighting happening and then it's being replaced by our new theme name.